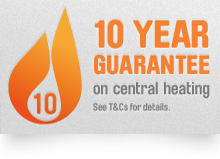 A reliable, efficient central heating system is the best way to keep your home warm and cosy. At Tuke Heating we are specialists in central heating installations in Wilsden and thanks to our many years of experience, we take great pride in the efficiency, reliability and professionalism of our services. A new central heating system is a major purchase and we know that investing in a new system can prove to be a daunting experience. We’re happy to offer free, impartial advice on all aspects of central heating – from complete system upgrades through to radiator or boiler replacements. When it comes to professionalism and reliability we’re hard to beat and whether you are a residential customer or a landlord with multiple properties, at Tuke Heating our central heating services are available throughout Wilsden. Our aim is to provide professional, friendly and no-fuss service at all times. When you contact us we’ll arrange an initial visit by one of our qualified, experienced Gas Safe Engineers who will assess your heating requirements and talk through the options available. All properties are different and when it comes to central heating, what is best for one household may not suit another. This is why we spend time with all of our customers to find the most appropriate central heating system to suit both their budget and lifestyle. Regardless of the size or scale of the project, we guarantee that our engineers will carry out their work to the highest standards each and every time. Thanks to our wide-ranging industry experience, combined with an in-depth and up-to-date product knowledge, means that we have the expertise to install a central heating system that’s tailor-made to suit your home or business perfectly. So what makes Tuke Heating different? By choosing us you’ll find that we are local central heating specialists with a reputation for offering a winning combination of unbeatable customer service, professionalism and reliability. We work extremely hard to ensure our clients are completely satisfied with our service and from your initial contact with us, through to the completion of the job, we promise to carry out an excellent job. If you would like further information on our installation, repair and servicing for central heating in Wilsden, please don’t hesitate to get in touch.